Our U10 hurlers finished off the Autumn League with an away game against Éire Óg on Sunday morning. It has been a really good league for this great bunch of lads. We’ve welcomed new players, trained hard and really improved on skills, work rate and teamwork. The future is bright! Our U10 hurlers continued to impress in the Autumn League with a home game against Coill Dubh on Sunday morning. It was a very competitive game with some super scores from both sides. The lads worked hard on marking the opposition and getting hooks and blocks in. They defended excellently and were sharp in attack. They are improving every week, great work lads! Moorefield Abú! Our U10 hurlers have had a great start to the Autumn League. They played Ardclough away last week in an evenly contested competitive game. Special mention goes to Lennán, John and Seán who all played their first ever hurling game – welcome lads! This week the team had a home game against Maynooth and continued to impress. The lads took advantage of the strong wind in the first half and scored some lovely points from distance. By the end of the game there were 7 players on the scoresheet and it was an overall brilliant team performance. Moorefield Abú! Our U10 hurlers played nearby Round Towers in the League Monday evening. It turned into a very high scoring game with the teams evenly matched. Both sides scored some fabulous points from play and there were some well taken frees also. The lads continue to improve their hooking and blocking skills and there were even some nice neat sideline cuts. Keep up the good work lads, Moorefield Abú! Another strong display from Moorefield’s U10 hurlers Sunday morning at home against Kilcock. Skills are improving week on week and there was some great pick-ups, hooks and blocks from the lads today. They were very committed and hardworking in defence and the midfielders and forwards got some lovely scores. Well done lads and thanks, as always, to the parents for their support and encouragement on the sideline. 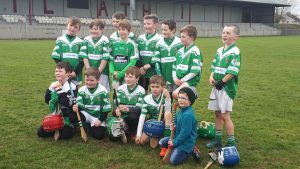 Moorefield’s U10 hurlers played their second game of the Spring League on Sunday morning at home against Cappagh. It was great to see player numbers up again, and a special mention to Ed, Cian and Jack, who played for the opposition to even out numbers. Never easy for players or coaches but it meant everyone got more game time and hopefully more experience as a result. Some lovely hand passing, hooks and blocks from the lads today – they are really beginning to play well as a team, supporting each other with some nice interplay. Impressive dance moves at the end too!! Moorefield’s U10 hurlers got the Spring League off to a great start yesterday morning with an away th e in Athy. Fantastic to see so many lads turn up, and a special mention to Connor and Jack, who played their first hurling match for Moorefield. Super skills on display all round – hooking, blocking, hand passes, strikes from the hand and roll lifts, not to mention the commitment and energy from everyone. It was a real team display, all the more impressive considering it was their first game in months. Well done lads and thanks to everyone on the sideline for the encouraging support.